The 2018 U.S Grand Prix outside Austin, Texas, once again proved itself to be one of the most dazzling events on the American sporting calendar, as well as one of the preeminent stops on the Formula 1 circuit. This was the case even without Lewis Hamilton securing his fifth World Drivers’ Championship at the event (something he accomplished the following week) and even though—for only the second time in the seven-year existence of the event at Circuit of the Americas—the race was won by someone not named Lewis Hamilton. There was a fear that weather might be a factor this year as the rain had been incessant in Texas all week, as it was for the event in 2015. Instead, the skies parted, Bruno Mars was able to perform on Saturday night, the race was filled with intrigue on Sunday and Britney Spears put a bow on the whole thing on Sunday night with a concert in perfect autumn weather. The reduced attendance at COTA in 2015 was due at least in part to nasty weather conditions caused by Hurricane Patricia, but there were pundits who suggested that the event may have been hurt by the resurrection in 2015 of the Mexico Grand Prix the week after the Austin event. In the first three years of Formula 1 at COTA (2012–2014), the number of tourists from Mexico was certainly noticeable. But even after the addition of the Mexico City stop in 2015, the 2016 and 2017 F1 races in Austin each set successive record attendance figures (the figures for this year’s race have yet to be announced). My own experience at COTA this year would suggest that any drop-off in tourists in Austin who choose to see only the Formula 1 race in Mexico City should be measured against the number of added sports tourists from other continents drawn by the allure of seeing not one, but two Formula 1 races back to back—and at a time of year when the drivers’ championship will likely be decided. Indeed, at my hotel I encountered two fans from Sweden who arranged a business trip around the Austin and Mexico City F1 events. 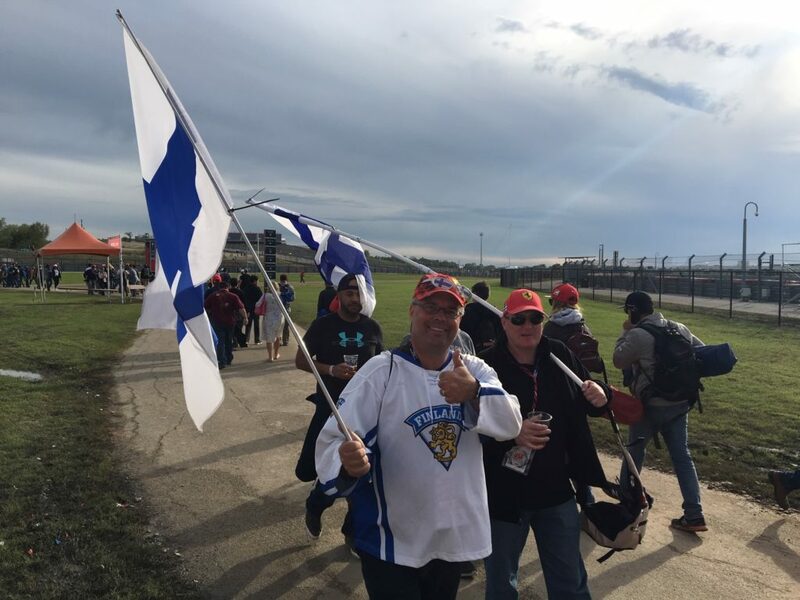 Their level of sports tourist satisfaction was only exceeded by two different groups of Finns that I met at COTA itself. They had travelled to North America to see two F1 races within a week’s time, not to mention Finnish drivers Valterri Bottas and Kimi Räikkönen—the loyal lieutenants of Hamilton and the other great F1 champion Sebastian Vettel. For their efforts, the Finns were rewarded by seeing their countryman, Räikkönen, win at COTA for his first F1 victory in five years and then Hamilton secure his fifth World Drivers’ Championship in Mexico City the next weekend. The Finns thereby achieved a rare exacta in sports tourism—getting to see what they came to see and capturing lightning in a bottle by seeing something that for them was delightfully unexpected. I don’t think the Finns, the Swedes or I will pass up a chance to return to COTA next year.